Brighton & Hove Albion head to Wolverhampton Wanderers on Saturday on the back of five successive defeats. The Seagulls lost 2-0 at home to Cardiff on Tuesday and are now just two points above the Bluebirds, who are third from bottom and in the relegation zone. Wolves went down 3-1 at Southampton in their last match, a week after blowing a 2-0 lead and losing 3-2 to Watford in the FA Cup semi-finals. In the meeting between the sides earlier this season, Glenn Murray got the only goal - his 100th for Albion - as Brighton won 1-0. What time does Wolves v Brighton kick off? The game gets underway from Molineux at 3pm. No. Albion's next televised match is the trip to Tottenham on Tuesday. Wolves appear to have a full-strength squad to choose from for Brighton's visit on Saturday. Raul Jimenez has starred in his first season in the Premier League with 12 goals and 10 assists, while Diogo Jota has seven goals and seven assists. Ruben Neves and Joao Moutinho pull the strings in the middle of the park, while Wolves' defensive record is the sixth best in the division. Currently eighth, Wolves are still right in the hunt to finish seventh which could be enough to seal a Europa League place for next season. Brighton winger Anthony Knockaert will miss the game through suspension and Seagulls boss Chris Hughton could again ring the changes after Tuesday's 2-0 defeat to Cardiff. Midfielder Yves Bissouma and right-back Martin Montoya were left out of the squad for that game and will be pushing to return to the squad. Gaetan Bong, Beram Kayal, Jurgen Locadia and Florin Andone will also hope to get back into the starting 11. Pascal Gross and Solly March returned from their respective injuries against Cardiff and are both likely to start at Molineux. 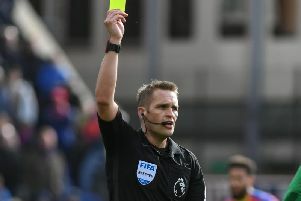 Craig Pawson will be the man in the middle for Brighton's match away to Wolves on Saturday. Pawson has taken charge of just one Albion game this season, the 2-1 victory at arch rivals Crystal Palace last month. He has shown 84 yellow cards and five red in 24 Premier League games this season. The assistant referees will be Lee Betts and Ian Hussin and the fourth official is Simon Hooper. Wolves are firm favourites to pick up the three points and are priced at 8/11 on PaddyPower. The draw is 12/5 and a Brighton victory is 4/1. Albion are 10/1 to repeat their 1-0 win from earlier this season and are 22/1 to return home after a 2-0 victory. Wolves are 4/1 to claim a 1-0 victory, 6/1 to win 2-0 and 12/1 to win 3-0. Wolves striker Raul Jimenez is favourite to score first at 7/2 and the Mexican is 6/4 to net anytime. Ivan Cavaleiro and Diogo Jota are both 5/1 to open the scoring and 21/10 to net anytime. Brighton striker Glenn Murray is 6/1 to get the first goal and 12/5 to score anytime, with team-mate Florin Andone 7/1 and 11/4 respectively.